Ready for Hillary, formed shortly after Clinton left the State Department by some longtime loyalists of the former senator and first lady, has focused on building a sizable list of Clinton grassroots supporters. It's also put organizers in key states, and has gone up with some digital ads. The group says it's also helping to elect Democratic candidates in this year's midterm elections. Clinton is not attending Netroots Nation. The conference is the largest annual gathering of progressives, who are a key part of the Democratic Party's base. 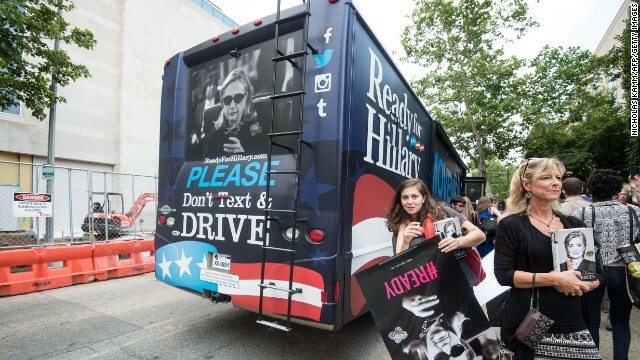 But several members of Ready for Hillary and Rising Tide, its digital partner, will be there, holding a session on how grassroots activists have changed the political landscape, and hosting a party for conference attendees. Vice President Joe Biden, who is also considering a 2016 White House bid, will speak at the conference, along with Sen. Elizabeth Warren of Massachusetts, who's considered a hero to progressives. Warren has said she won't run for president in 2016. Hillary's biggest problems: Will Dems. forgive her for her Iraq War Vote ? Can she go through a whole Campaign w/out getting Swift Boated ? There is no such thing as a progressive.........there are only wasteful, squandering liberals, who seek dictatorship in America. That is only progressive for those who seek to live under a dictator. Hillary has no chance at all........of winning. She cannot win the primary. Anyone who opposes her, will garner more votes. Vote for Killary, vote for the destruction of this country at the hands of an incompetent, grossly negligent liar. Hillary16. First woman president to freeze immigration. I've seen Three Kinds of Repub. Hate in recent times: Bill Clinton Hate, Hillary Clinton Hate & No. 1, Obama Hate. The GOP/TP is regressive, wanting to always go back, to a mythological past, the good old days when you could plunder and discriminate against anyone without a care. The opposite of regressive is progressive, and I am glad to call myself one. And I will vote for one to move forward. Like all the other non-troversies, she has explained this repeatedly. Our president at the time was lying to the nation. Many people were deceived by the WMD, the centrifuge tubes, the uranium imports, the Al Qaeda presence, etc, etc. She voted based on the trust of false intelligence. Now we know the truth about W, back then only suspected. PS-I'm from the South; and thoughIi was only in the Fourth Grade, I do remember LBJ Hate. He was called a "N" Lover by some of my fellow Fourth Graders. But the left has shown nothing but love and kindness to Bush & Cheney correct? You reap what you sow. Hillary Clinton is the originator of the video lie. It first came out of the State Dept. and she even repeated it in person to the families of the 4 Americans she got killed then abandoned. She then pushed to have the maker of the video arrested to bolster her lie. Fact is SHE is the one that should be in prison for her gross negligence in the death of her direct report, Ambassador Stevens. If she gets elected expect many more to die because of her incompetence. Concerned citizen..want to see hate? Read the disgusting blogs on the Dr Carson article..
Vote Republican , Drive a Hummer ! Republicans and their illegals are gone with the wind. So what is a Progressive? They follow the old Liberal Mantra. WITH YOUR MONEY AND MY BRAINS, WE WILL GO PLACES. So far we have an 18 Trillion Dollar Federal Debt and all the Trimmings. Hillary is part of that Debt. Jobs? Don't even mention it !